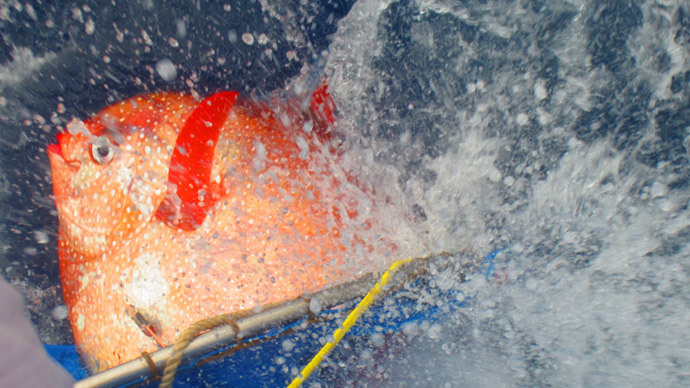 Researchers have discovered that the moonfish, or opah, is the first ever fully warm-blooded fish, using its unique biology for more effective hunting in the freezing ocean. 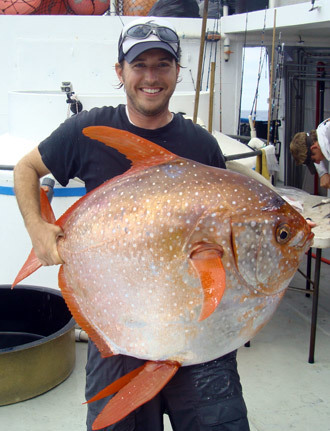 The car tire-sized opah is found in water off the coasts of the US, Australia and several other countries. Its unique properties have been discovered by scientists from the US National Oceanic and Atmospheric Administration (NOAA) and reported in Science magazine. The researchers caught an opah near the US west coast, implanted thermometers in its body and released it back into the water. This allowed them to detect that it keeps its body 4 to 5 degrees Celsius warmer than the surrounding water, something previously unseen in a fish. Some large predatory fish, like sharks, have been found before to be able to warm separate parts of their body, such as eyes or brains, to boost their eyesight or hunting ability. The opah was previously thought to share that ability. But full-body endothermy (the ability to keep constant body temperature regardless of the environment) has so far only been found in birds and mammals, including humans. "There has never been anything like this seen in a fish's gills before," said biologist Nick Wegner, the lead author of the report, cited by the NOAA Fisheries website. Opahs achieve this by constantly flapping their fins and using an internal heat circulation system within its fins scientists have compared to a car radiator. In other fish the gills lose most of the body heat through unavoidable contact with chilling seawater. The opah dwells at 50 to 500 meters underwater, possibly diving deeper at times. At this depth, water can be as cold as 4 degrees Celsius, making most fish sluggish and slow-moving. Predators here rely on ambushing their prey rather than chasing it. The opah subsists by hunting fish and squid, and its endothermy gives it an edge by allowing it to move more quickly than a cold-blooded fish would. "Before this discovery I was under the impression this was a slow-moving fish, like most other fish in cold environments," Wegner said. "But because it can warm its body, it turns out to be a very active predator that chases down agile prey like squid and can migrate long distances."